This event can’t happen without your help and so many pitched in to make it a success. Many prizes were won and many laughs were had! Special shout outs to Hannah Beth Millman, Justin McWhorter, Paige Teusenik, Nikki Zimmerman, Mike Leo, Rembe Groach, Chelsea Muse, Ms. King, Kim Shashy, Kari Lovell, Martha Kesenich and all the amazing volunteers who jumped in to help. 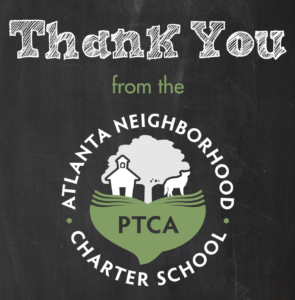 This year we gave away some amazing prizes thanks to sponsors like Found Co in Decatur, Six Feet Under, Grant Park Coffee, Quality Wines, Bennett’s Market, Spoon Eastside, the 8th graders at the concessions stand, ANCS Store, Wonderball and RWTW committees. See you next year- Marta Leo and Cathy McWhorter.